Why not warm up by looking at the forecast of spring trends in home decor? Here are a few of my favorite home design trends you'll be seeing in the upcoming months. After spending the weekend in New York City, I'm well aware that my friends on the East Coast are in need of some warm weather. I'll keep my fingers crossed that it happens soon, but in the meantime, why not warm up by looking at the forecast of spring trends in home decor? Here are a few of my favorite home design trends you'll be seeing in the upcoming months. Remember digging through drawers of geodes at the Nature Company as a kid? Well it's time to get back in touch with your inner mineral lover. Geodes are back, and making a big splash in home decor spring trends. Whether it's a large chunk of rock as a statement piece on a desk or dresser, a pair of geode bookends, a crystal rock lamp, a keepsake box with a rock set in the top, or a geode side table, find a way to incorporate this trend into your home decor. For a pop of color and crystal, I love this framed rock art. 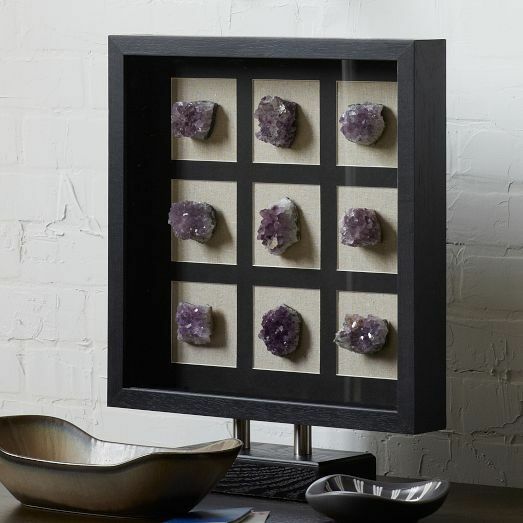 Geode decorative frame, west elm, $149. Looking to add a touch of color, but not a fan of bold hues? This is your year! Muted colors and over-dyed fabrics are where it's at with this year's spring trends. With washed out patterns, tie dye, ombres, and dip-dyes everywhere, it's easy to incorporate this spring trend into your interiors. Think about using this trend in rugs, linens, curtains, throws, pillows -- even napkins or table cloths. 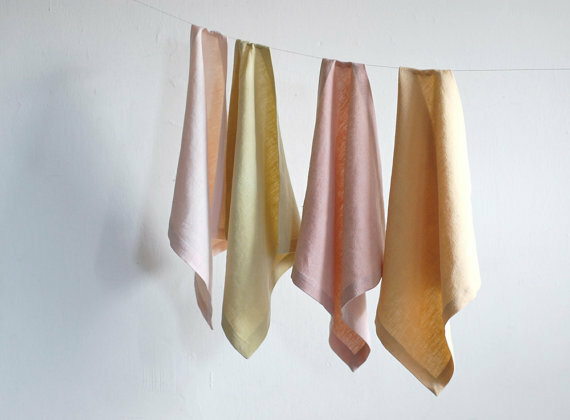 I'm obsessed with cloth cocktail and table napkins and love these hand dyed napkins from etsy. We've been seeing a lot of natural wood the past few seasons, and this spring we'll see even more. From IKEA's Stockholm collection to upscale furniture showrooms, natural wood furniture with a smooth, matte finish is the hottest trend in furniture and home decor. If you're not up to investing in a new dining table or sideboard, why not add a rich wooden bowl or tray? 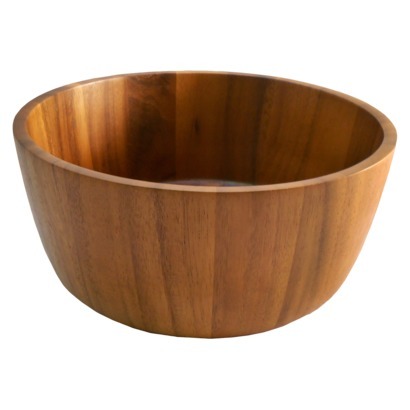 A favorite wooden accessory: the ultra modern wooden bowls and trays from Target's Threshold collection. While we're seeing a lot of natural and rustic forms, we're also seeing bit more glam in home decor, which means I'm in heaven! I love a little glitz and super shiny metals. If you're really bold, you can go all out with gold metal furniture or keep it a bit more subdue with a few gold decorative accessories. 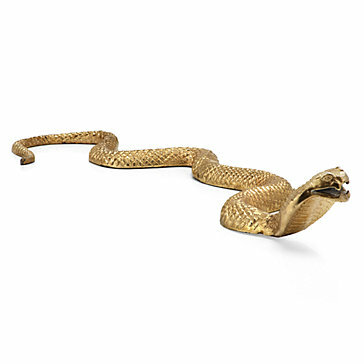 On my must-have list: this golden cobra (did I mention snakes are also all the rage this year?). Of course, I love to indulge in the latest home decor trends, but my advice, as always, is don't go overboard. Try to buy things with a classic edge or a subtle nod to mega trends so they'll remain in fashion for years to come. But most importantly, remember that trends come and go, so be sure to buy what you love. Still craving more spring trends, check out these hot patterns in home decor. What spring trends in home decor have you spotted this season?